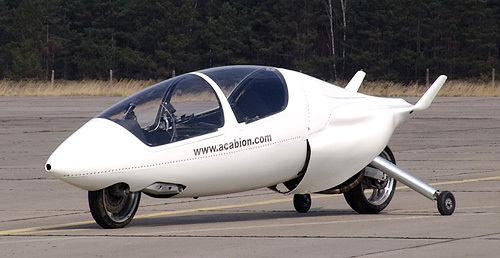 Acabion GTBO Enclosed Motorcycle | OhGizmo! If speed is your thing but Lockheed won’t let you buy one of their fighter jets then I can assure you the Acabion GTBO motorcycle is easily the next best thing. First off in terms of design the outer housing is essentially shaped like a bullet meaning you’re not going to find anything more aerodynamic that’s also capable of holding 2 persons. Secondly it’s powered by a 700 hp turbocharged engine which given the weight of the bike results in a power to weight ratio of 0.51kg per horsepower. That outdoes everything from the Bugatti Veyron to even Formula One cars. The best part though? Acabion claims this thing is actually street legal. What’s even more impressive is that the GTBO is one of the most fuel-efficient vehicles out there, even when travelling at its ridiculous top speeds. Of course it’s not exactly ideal for making a grocery run given the lack of a trunk, but I’m sure most people will be able to overlook that issue. Sadly, the chances of actually seeing a GTBO on the road are quite slim. The company only plans to build a total of 26 vehicles from 2007-2011. And if you want to be one of the lucky few to get your hands on one you’ll need to shell out about $720,000. That’s fast! With it’s limited production its seems like I won’t be able to see one of those on the road. And who would run that in a traffic road? How heavy is the body and how can that turn around? Since it’s big and bulky, I don’t think it will be easy to use that. but with that speed, maybe you can join a motorcycle race!